To a child, a city is a chaotic, vibrant community whose workings can seem quite mysterious. How did people create subways? How does the water get to the very top of a skyscraper? Is there any organization to a bustling metropolis? 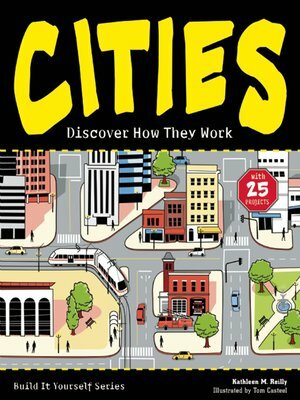 Cities: Discover How They Work will give kids a view into the inner functioning of these urban areas. They'll learn about all the parts that come together to make cities work and how they've grown and changed since the very first riverside settlements. Fascinating sidebars, unique illustrations, Words to Know, and fun Did You Know facts combine with age-appropriate hands-on activities to make learning about complex urban environments fun and reinforce learning. Projects include creating subway cut-aways to understand how transportation systems work, building an aqueduct to learn how cities get water, and experimenting with skyscraper design and water filtration. This STEAM title, which integrates science, technology, engineering, art, and math includes a glossary, list of resources, and index. Cities meets common core state standards in language arts for reading informational text and literary nonfiction and is aligned with Next Generation Science Standards. Guided Reading Levels and Lexile measurements indicate grade level and text complexity.